Have you ever had a child ask you the meaning of a word, but really it’s more than just a word? 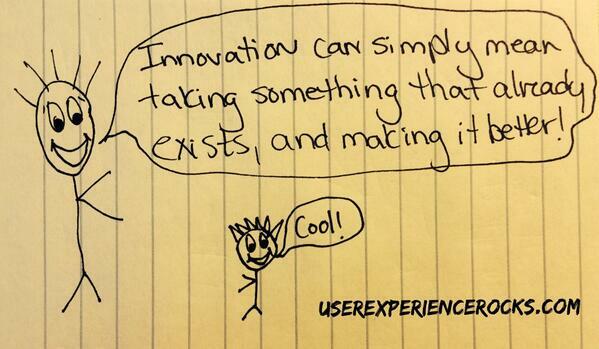 I ran into that situation earlier this week when my daughter asked me what “innovation” is. I work in the Product Design & Innovation department at my company, and she saw it in my title. I had to really think about my response for a while. I could have just rattled off the dictionary definition: “a new idea, device, or method” (thanks Merriam Webster dictionary), but to me innovation is much more than that. Innovation is looking at the world around you, and constantly envisioning ways it can improve. An innovative idea doesn’t have to be something brand new that has never existed, it can just be a new way of improving an old product. Take the Coolest cooler for example. A group of designers looked at a boring old cooler whose core design hasn’t changed much in the past 50 years and said, “Man, coolers are pretty lame. Let’s make an awesome one.” As of today their Kickstarter campaign has hit $1 MILLION dollars in funding. Innovation doesn’t have to mean making something brand new that has never existed. It can simply mean making something that already exists, extraordinary.